This kitchen proves that traditional design elements are anything but tired. See how sleek and contemporary stainless steel appliances work well with Pat's primitive collections. The classic elements are all here: heart-pine, paint colors with a rich past, an impressive collection of Southern antiques. But how this homeowner uses them is a stylish surprise. Pat Wheeler found inspiration in the wonderful historic houses in her hometown of Columbus, Mississippi, but by rethinking tradition, she creates a kitchen for herself and husband Doug that echoes the past in a thoroughly modern voice. Heart-pine flooring salvaged from an old home is repurposed as countertops. "They were more than 115 years old and black when we got them," Pat remembers. The 14-inch-wide boards were remilled before simply being rubbed with tong oil and coated with polyurethane. No stain. The time-toughened soft wood has proven to be pretty and hardworking in its 10 years of kitchen duty. 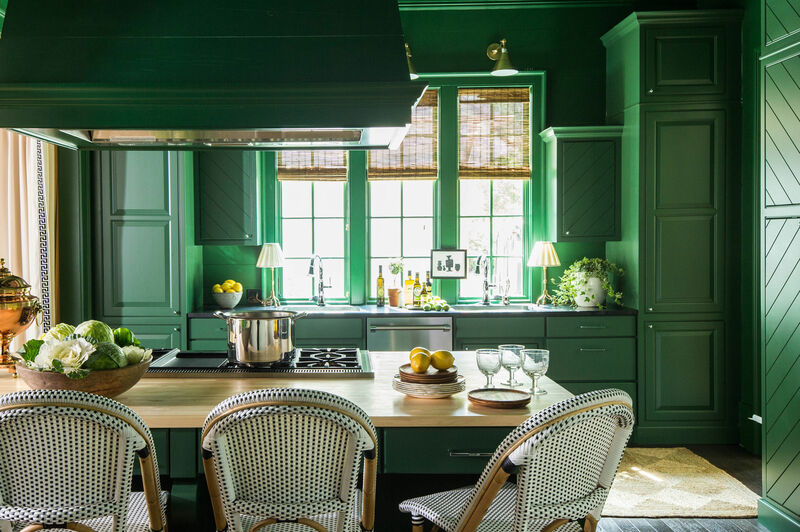 The color of the cabinetry is a take on Williamsburg green, which was wildly popular during the restoration frenzy of the mid-20th century. Pat tweaked this hallmark hue with a touch of gray to soften the contrast with the white walls. The walls themselves are plain horizontal boards. "I had the hardest time getting my carpenter to understand that I didn't want all the boards to match up perfectly in the corners," Pat explains. "I wanted the cracks to be staggered and irregular. It's difficult to teach imperfection." 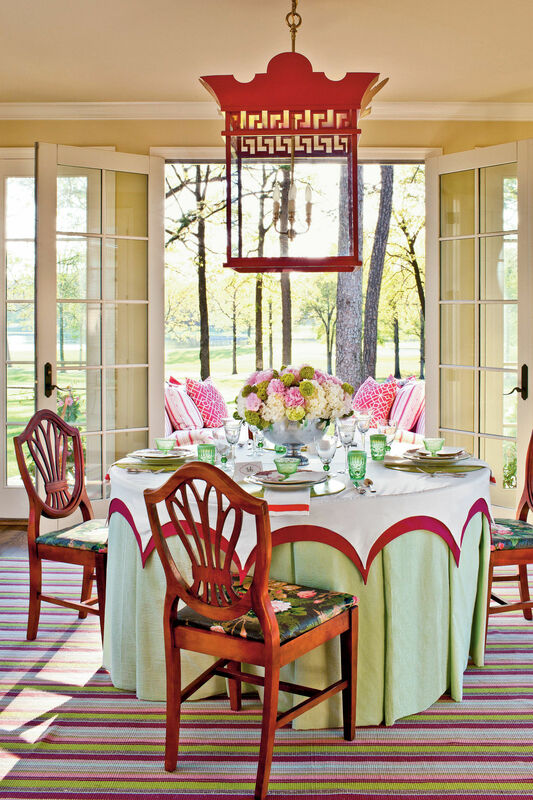 Pat has collected Southern-made primitive antiques for more than 15 years, and her artful displays spice up her nouveau-country kitchen. "People always go for the grand, elaborate antiques, but primitives are sometimes easier to find and less expensive because people don't realize how important they are," she says. A simple pine farm table now serves the seventh generation of Pat's family and fits right in with other acquired heirlooms. A pine cabinet holds a collection of green McCoy pottery and is topped with a grouping of kerosene lamps. She arranges a regimented row of white ironstone mixing bowls and simple brown stoneware crocks above the cabinetry. The result is a fabulous modern look straight out of the past. Before you begin your own country collection, we have a few terms and tips to help you on your treasure hunt. Southern primitives are vernacular pieces made in the South, usually by the person who meant to use them. Pine tends to be the most common material for such items. They tend to be less refined in appearance than high-style antiques and, typically, are of pegged construction (parts are held together with wooden pegs driven into preformed holes). Start small. Dough bowls (oblong wooden bowls used for breadmaking) or simple stools and benches are a good introduction to primitive collecting. 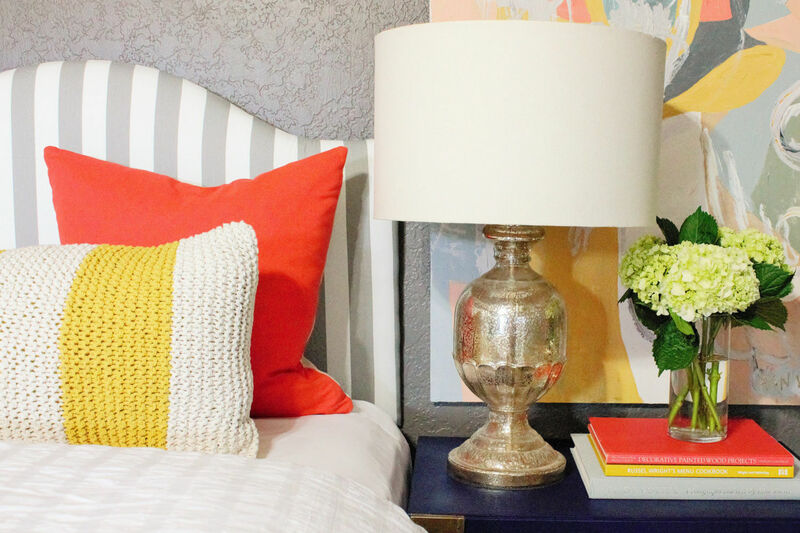 They're plentiful, relatively inexpensive, and make great accents in any decor. The Heart of Country Antiques Show in Nashville (February 14-16, 2008) is a perfect resource for buying or learning. Visit www.heartofcountry.com for more information. 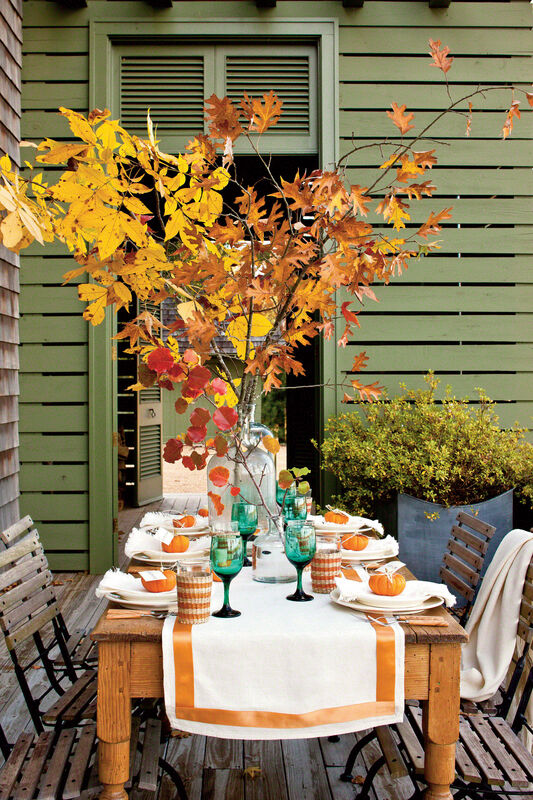 "Country Charm" is from the December 2007 issue of Southern Living.